Timber laminate flooring is a term widely used in the market of Australia.In short,the "floating timber flooring " is called timber laminate flooring ,either HDF laminate flooring or HDF laminate flooring with different core density internationally.Floating is a word to describe how the timber floor is installed ,which means the floor board is installed directly onto concret with a foam backlayer,and the HDF timber flooring looks like floating but not firmly naildown onto hardwood deam or plywood.The scientific name of HDF OR MDF laminate floating timber flooring is : "impregnated paper laminated wood flooring"
The laminated timber flooring is constrcuted in four composite materials- wear resistant toplayer,decorative paper layer,high density fiber board core or Middle density fiber board core,on the bottom is Balance layer. 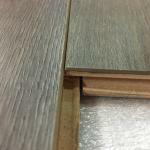 The first layer with super wear resistance is reinforced by a critical aluminium oxide coating which is transparent.This layer decide how long the laminate flooring can be used.Usually, higher density and more layers of such aluminium oxide protective layer will prolong the life of laminate flooring.According to regulations in different countries,the wear resistance of timber laminate flooring used on commercial buildings must reach AC4-AC5 ratings. The decorative layer for HDF floating timber floors comes with a vast varieties of colors,as it is printed by computer simulation process not like real hardwood 100% naturally.Refined wood & cotton pulp are the main content of the flooring paper layers.A certain opacity is needed when to apply a very dark color tone on the flooring top. It is intended to prevent the glue penetration into the decorative payper.15% titanium powder VS 100% titanium dioxide is a suitable proportion. High quality laminate floors normally with a density of more than 830kg/m3 in core.Another meansuring standard is to test how long after impregnation into water the board will swell as how much it swelled.In the point of view,high purity core of HDF or MDF usually has better resistance to dampness as it signifys the good quality wood material processed during manufacturing.Uniclick waxed edge along the flooring core is considered as the best quality laminate flooring. This bottom layer with 0.2-0.3mm is used to raise the machanical strength as well as dampness resistance of the floating timber laminate flooring.